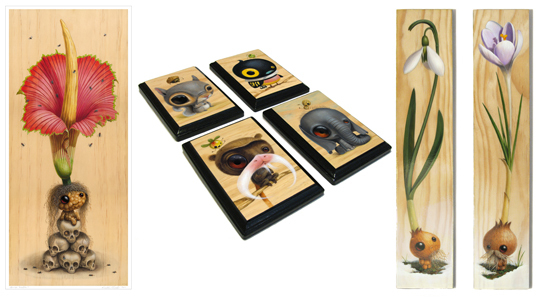 I just put a ton of new items in my shop (ten to be exact) including a 17" print of "Bunga Bangkai", all four critters from the 'I'm Not Hungry' series mounted on plaques as well as the flower duo, "Augustus Crocus" and "Master Galanthus". I also spotted a couple of older images of mine that I never mounted before and thought they might make someone happy :) I present "Scratch" and "Mommy's Little Prince". Also in the 'older image' file but with a twist, I decided to make "Uni Yeti Snow" but with a white border. It's glossy and bright and it really does look great! What? Ten new prints just aren't enough for you? Well I've got one more and it's exlcusive to Gallery Nucleus..."Good Rocky's Revival". As always, thanks for looking and keeping me painting!